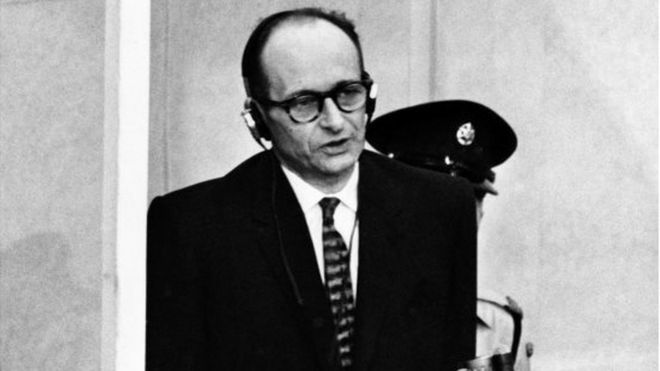 Adolf Eichmann, an architect of the Nazi Holocaust, protested his innocence in a final plea against his death sentence, newly released papers show. Eichmann told Israel’s president that he had only followed orders and was not responsible for “the unspeakable horrors” carried out against Jews. Six million Jews were murdered by the Nazis during World War Two. Israel released the papers on Holocaust Remembrance Day. Eichmann was convicted in Jerusalem and hanged in 1962. Marking the publication of the hand-written documents, Israeli President Reuven Rivlin said: “Not a moment of kindness was given to those who suffered Eichmann’s evil – for them this evil was never banal, it was painful, it was palpable. 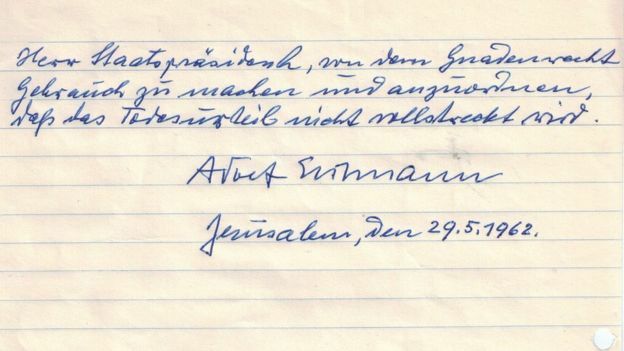 The papers reveal that Eichmann believed the Israeli judges who oversaw his trial had “made a fundamental mistake in that they are not able to empathise with the time and situation in which I found myself during the war years”. Eichmann, who played a key role in the 1942 Wannsee Conference at which the Nazis’ annihilation of European Jewry was planned, spoke in his appeal of the “unspeakable horrors which I witnessed”. “I detest as the greatest of crimes the horrors which were perpetrated against the Jews and think it right that the initiators of these terrible deeds will stand trial before the law now and in the future,” he wrote. Eichmann was captured by Israeli intelligence agents in 1960 in Argentina, where he was living as a fugitive, and smuggled to Israel, which put him on trial. His plea for clemency was rejected and he was hanged in Ramle prison. This entry was posted in News & Articles on January 28, 2016 by Elon Perry. Palestinian militant group Hamas says seven of its fighters have died after an attack tunnel they were working on in north-east Gaza collapsed. The tunnel near the Israeli border collapsed after heavy rain, it said. Palestinian militants have used tunnels on Gaza’s borders with Israel and Egypt to launch attacks on Israel, transport weapons or smuggle goods. Israel destroyed dozens of tunnels during the 2014 Gaza conflict, but Hamas has been rebuilding them. 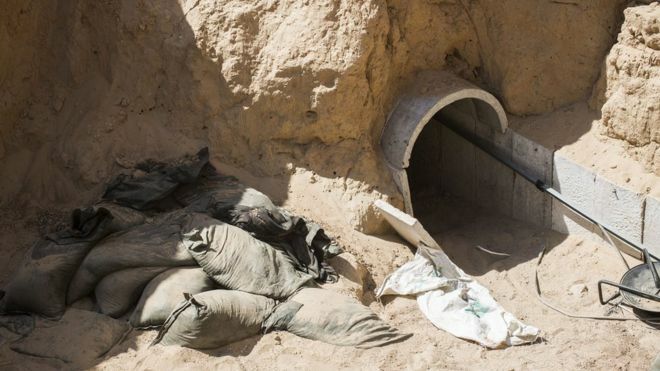 Meanwhile, tunnels on the Egyptian border have been used to smuggle weapons into Gaza, as well as civilian goods. The tunnels have played a vital role in the economy of Gaza, which has been under a blockade imposed by Israel and Egypt in 2007. The Egyptian military began flooding tunnels on its borders late last year, and says it has eliminated about 90% of them. Israel occupied Gaza in the 1967 Middle East war and pulled its troops and settlers out in 2005. Israel considered this the end of the occupation, but it still exercises control over most of Gaza’s borders, waters and airspace. Egypt controls Gaza’s southern border.